Music plays an integral part of our worship life. We enjoy music from a wide range of musical styles, genres and composers: classical, spirituals, Taize, world music, traditional hymns, American folk songs, Anglican chant, jazz-inspired anthems...anything that will make your heart sing! And we hope that you will also sing with your voice, whether you are in the congregation or in the choir. St. Augustine is credited with having said: "He [or she!] who sings prays twice." So we offer our singing and our music with love and joy as prayer and praise to God. All Saints’ has a Junior Choir for boys and girls grade 2 and older which meets on Thursday evenings from 5:00-6:15pm. While we rehearse we also learn the basics of music and musicianship, according to the Royal School of Church Music "Voice for Life" program. We have a Adult Choir which also meets on Thursdays from 7:30-9:30 pm. In choir friendship and fellowship are as important as the music. Both choirs sing weekly at the 10 am service during the school year. Small Saints Choir This choir, for our youngest singers, is an introduction to the junior choir and the RSCM program. Kids in grades K-1 are invited to come on Thursdays from 5:15-5:45 for rehearsal with the junior choir. 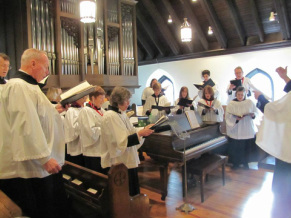 Small saints choir will sing in worship once a month for the family worship service (the first Sunday of the month) during the choir season, October through June. Childcare can be provided until 6:30 for small saints with older siblings in junior choir. We also have a Handbell Choir, which rehearses as needed for particular services, playing our three-octave set of Malmark bells. No previous experience is necessary. If you are interested in participating (or just trying it out) we can teach you what you need to know! Members of the congregation also contribute their talent on various instruments, including: flute, clarinet, violin, drums and trumpet. All of our music groups are open and welcome new members.Anyone who loves to sing, or who has an instrumental talent who would like to contribute to the spiritual life at All Saints’ is encouraged to contact Alison Siener Brown. All are welcome! 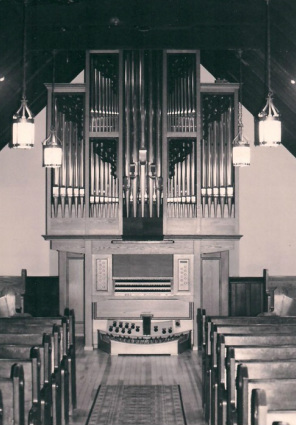 The All Saints' organ is a three-manual, 34 rank instrument, with tracker action in the French style. It was built in 1999 by Gilbert F. Adams of North Carolina. 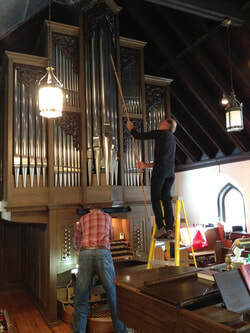 It stands in the rear of the Church to support the singing of the congregation. Alison Siener Brown has her Master's of Music in Sacred Music and Organ Performance from Northwestern University and an undergraduate degree in Sacred Music from Westminster Choir College in Princeton, NJ. She directs the choirs and accompanies our congregational singing on the organ and the piano. Alison also teaches music to young children (babies through early elementary school) in her Musikgarten studio. The classes are held in All Saints' choiur room, under the auspices of Music in the Somerset Hills.